This flick faithfully subscribes to the major conventions that characterized the science fiction genre during the paranoid '50s, but it's so well done that it's required viewing for those interested in modern cinema. Arguably, Ray Harryhausen is one of the greatest magicians to ever set foot on Earth. His wonderful skill is not the kind that is showcased on a stage though, but the one that ends up immortalized on celluloid. During the length of his professional career, spanning 25 years and 15 movies, Harryhausen persistently took the standards of special visual effects to new heights with techniques such as "stop-motion animation" (i.e., animation of an object frame-by-frame) and "optical compositing" (i.e., superimposing the object into the film action). Even though Harryhausen is little known outside the fantasy genre, one cannot deny that he has been among the most influential forces in Hollywood. Admired and beloved by legions of fans, Harryhausen inspired several writers and directors, and his technical achievements were crucial in the development of the special effects industry into the artistic and technological behemoth that it is today. A perennial testimony to his legacy is the fact that each film that showcases his talents is usually referred as a "Harryhausen movie". A dramatic feat, as such a sense of authorship is usually reserved for directors and actors. But to consider Harryhausen as an auteur is not an exaggeration. More than a creator of complex visual effects, Harryhausen was a creator of characters, literally bringing to life a menagerie of fascinating creatures. Working alone in all his films, he laboriously designed, constructed, animated, photographed, and directed his captivating creations. Harryhausen was born in 1920 in Los Angeles. Inspired by the revolutionary visual effects created by Willis O’Brien for King Kong (1933), Harryhausen decided to experiment with animation and stop-motion animation in a variety of short films. By the late '40s, Harryhausen had established his name in the field, and O’Brien himself hired him as an assistant animator for Mighty Joe Young (1949), which received an Academy Award for best special effects. The experience that Harryhausen gained working with O’Brien allowed him to land leading jobs on the field, creating the special effects for a series of terrific science fiction movies that became hugely popular during that time. And even though these early Harryhausen's films feature low production values, he was able to bring to screen compelling monsters that were rarely seen in other movies of the same period. For instance, some of the memorable scenes that Harryhausen created in these flicks include a prehistoric monster eating a policeman for The Beast from 20,000 Fathoms (1953), a six-legged octopus climbing the Golden Gate Bridge in It Came From Beneath the Sea (1955), and an alien ship crashing into the US Capitol building in Earth vs. the Flying Saucers (1956). At this point in his career, Harryhausen enjoyed enough creative control as to decide which projects he would work on. Dreaming since a young age to travel to Europe, but unable because of his humble upbringings, Harryhausen insisted on his next film to take place in the Old Continent. The result was 20 Million Miles to Earth (1957), a flick that faithfully subscribes to the major conventions that characterized the science fiction genre during the paranoid '50s. The plot of this film is indeed rather simple and unsophisticated. When the first spaceship to Venus crashes off the coast of Sicily, a small alien specimen brought aboard by the crew escapes, grows to giant size, and goes on a rampage in the streets of Rome. And towards the film’s end, the always reliable US military is able to defeat the alien menace. 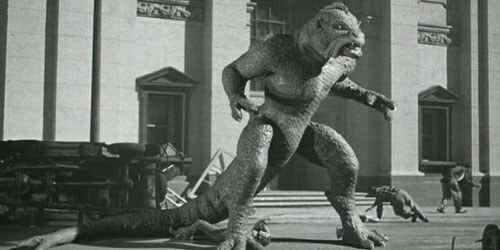 This vulgar humanoid lizard from Venus, better known among sci-fi fans as the Ymir, is perhaps the first monster that embodies what would soon become the Harryhausen trademark: it does not have the dreaded "man in a rubber suit" look; rather, it has a generous amount of screen time in plain view during daylight, and acts in a truly compelling way. In spite of its obvious monstrosity, Harryhausen's creation comes as a truly sympathetic and lovable being. And truth be told, the Ymir showcases a much wider emotional range than any of the actors in the film. In this regard, a truly memorable moment from 20 Million Miles to Earth is the hatching scene. Here, the Ymir comes out from the alien egg, looks around at his new environment, and rub his eyes in disbelief. As the movie progresses, the Ymir is portrayed less as an evil monster bent on destruction, but more as an innocent victim of human selfishness. By the time 20 Million Miles to Earth went into production, Harryhausen had nearly perfected his “Dynamation” technique in black and white film stock, which was radically different from the procedure used by O’Brien in King Kong and Mighty Joe Young. Indeed, O’Brien’s process involved the introduction of live-action footage into a miniature set, while Harryhausen’s method placed his animated creatures into live action footage. Clearly, Dynamation was a superior technique that permitted seemingly realistic scenes of fictitious monsters sharing the scenario with their human counterparts. But even though the artistic, technical, and scientific brilliance of Harryhausen's work is unquestionable, this is a good point to try to further understand what exactly made his movies so captivating. Arguably, a major reason for their success is the fact that the most amazing sequences of his films usually involve the insertion of fantastic monsters in live action footage with a background that is a recognizable landmark or monument. Such is the case of the Roman Coliseum in 20 Million Miles to Earth. Here, the mise-en-scene becomes highly attractive and seductive because of the paradoxes that the scene embodies, aesthetically combining fictional and factual spaces in a very convincing way. Without a doubt, such a fusion of the imaginary with the real in a seamless illusion is the cornerstone of any magician's trick. And in this regard, Harryhausen's Dynamation process gave his films an unmatched advantage. When compared to other cinematographic tricks of the period, such as the "man in the rubber suit" seen in Godzilla (1954), the life-sized animatronic ants portrayed in Them! (1954), the lizard filmed inside a miniature set in The Giant Gila Monster (1959), and the truly ludicrous chicken marionette in The Giant Claw (1957), Harryhausen's work for 20 Million Miles to Earth looks very realistic. And even in our modern world of computer generated excesses, Harryhausen’s effects for 20 Million Miles to Earth continue to make for compelling watch. While it is true that the Ymir has a gait that is noticeably abrupt and jerky in comparison to the smooth and anatomically correct animations made nowadays with computer graphics, one could argue that the Ymir’s unnatural movements just add to his "otherness". It is important to note that the success of 20 Million Miles to Earth permitted Harryhausen to continue improving his compositing and stop-motion animation techniques. He eventually solved the technical hurdles involved in the far more challenging aspect of optical compositing using color film, and went on to create truly masterworks such as The 7th Voyage of Sinbad (1958) and Jason and the Argonauts (1963). To celebrate the 50th anniversary of 20 Million Miles to Earth, Sony Home Entertainment released a lavish 2-DVD set presentation with plenty of interesting extra features. The film itself is beautifully presented in its original black and white format, and also in a colorized version. While most purists will recall with real horror the terrible mid-'80s attempts at colorization of films, 20 Million Miles to Earth looks fantastic. The novel restoration and colorization process used for this film, which involves sophisticated feature recognition algorithms, is briefly explained in one of a features included on the DVD. Interestingly enough, Harryhausen himself confesses his admiration at the final result. Perhaps not surprisingly, nearly all the bonus content in this DVD set delves one way or another into the technical aspects of 20 Million Miles to Earth. Most notable is the insightful audio commentary with Harryhausen and visual effects gurus Dennis Muren and Phil Tippett, which is full of details about the construction, animation, and compositing of the Ymir. Equally interesting are the couple of features where directors of the caliber of Tim Burton and Terry Gilliam confess the immense influence that Harryhausen’s work had on their lives. Finally, the underrated work of composer Mischa Bakaleinikoff is analyzed in great depth by soundtrack producer David Schechter. Oddly enough, this 50th anniversary edition omits the outstanding documentary The Ray Harryhausen Chronicles, which was found on the previous DVD incarnation of 20 Million Miles to Earth. This hour long documentary examines the entire career of Harryhausen, from his early experimental shorts to his last film, Clash of the Titans (1981). Along the way, we are treated with movie scenes, rare stills and terrific conceptual drawings for most of his animated creations. Personally, even after repeated viewings, I continue to be fascinated by this enthralling documentary. Thus, those die hard Harryhausen fans will have to keep both editions in their DVD collection. While 20 Million Miles to Earth may not the best film Harryhausen made, it is certainly representative of the maestro’s oeuvre. Also, even if the flick blindly followed the conventions of the genre, its special effects were groundbreaking at the time of its original theatrical release. 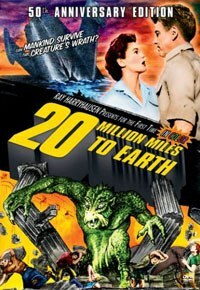 As such, 20 Million Miles to Earth is required viewing for those interested in modern cinema.